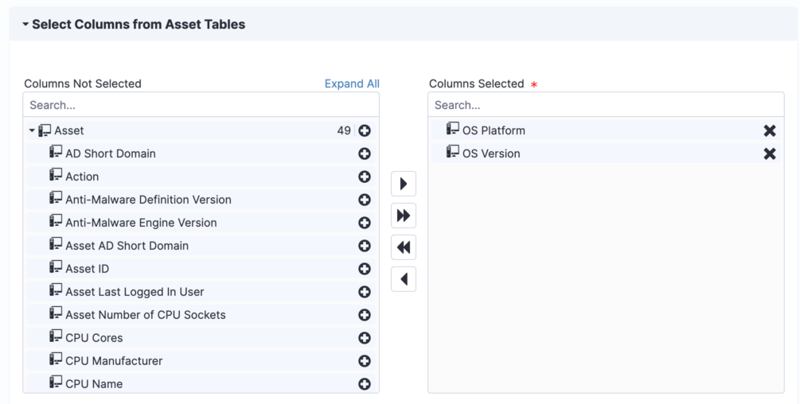 Use views to create filtered versions of Asset data for exporting to destinations, including Tanium Connect, ServiceNow, and Flexera. You can specify attributes to include in the data set and use filters to limit the computers that are included in the view. You can include fewer attributes than the default view, depending on the use of your view. From the Asset menu, click Views. Click New View. Give your view a name and description to help you remember the purpose of the view later. The view name must be unique among all views in Asset, including views created by other users. Select the attributes that you want to include in your view. (Optional) Add filters to limit the computers that are included in the view. You can create filters for Asset Details, Asset Installed Applications, Asset Logical Disk, Asset Network Adapter, Asset Physical Disk, Asset Windows Installer Applications, or any custom reference attributes that you have added to Asset. Click Add > Add Row to create a filter rule that is at the same level as the selected rule. When you create the rule, you can choose whether the filter applies AND or OR operators with the other filters at that level. To create nested groups of filters, click Add > Add Row. Click Expand to view a JSON representation of the rule, which can be helpful to evaluate complex filtering. To copy a filter rule, click Copy . To edit a filter rule, click Edit . To delete a filter rule, click Delete . By default, computers are in the view even if the fields in the filter do not have associated values. If you want to require that results are returned for the fields in the filter for a row be included in the view, select Must Have for the filter. To see what data is in a view, you must create a destination. Export data from a view to Connect destinations such as Email, File, HTTP, Socket Receiver, Splunk, and SQL Server. See Tanium Connect for more information about configuring connections, and the recommended formatting options to use for each connect destination type. These reserved views are read-only. Click View to see the set of fields that are included in the reserved view. If you want to customize the fields or filters, click Create Copy. Edit and rename the view. You might want to create a new view to limit the computers that are included in the ServiceNow export. For more information, see ServiceNow CMDB. When you configure a Flexera destination, views are automatically created, and connections that use the views are created within Tanium Connect for exporting data to your Flexera staging database. For more information, see Flexera FlexNet Manager Suite.